Eight new communities from Palm Beach to Palm Springs Include “agrihoods,” preserved open space and WiFi cafes. • Shearwater, St. John’s County, Florida (near Jacksonville). A 1,524-acre, 2,600-lot community with 13-miles of walking trails through 600 acres of preserved habitat, parks, fields, lakes and canoe/kayak access to Trout Creek. Shearwater is now open with new homes for sale. • Legacy at Jordan Lake, Chapel Hill, North Carolina. With 304 homesites on 316 acres, the masterplan includes resort-style pool and clubhouse, golf course, walking trails, and community gardens in the rolling hills of the North Carolina Piedmont with views of Jordan Lake. Homes are now selling. • Durham Farms, Hendersonville, Tennessee (near Nashville). With 1,090 lots on 472 acres, Durham Farms offers a small-town lifestyle with tree-lined streets, ample green space, neighborhood parks, and nearly three miles of walking trails on Old Hickory Lake. New homes now selling. • Headwaters, Dripping Springs, Texas (near Austin). This new 1,035-acre development has 1,000 lots. The community includes broad expanses of natural habitat, including Barton Creek and five protected hilltops, plus resort-style split-level pool, Wi-Fi café, and eight miles of trails. Homes now selling. • Orchard Ridge, Liberty Hill, Texas (near Austin). 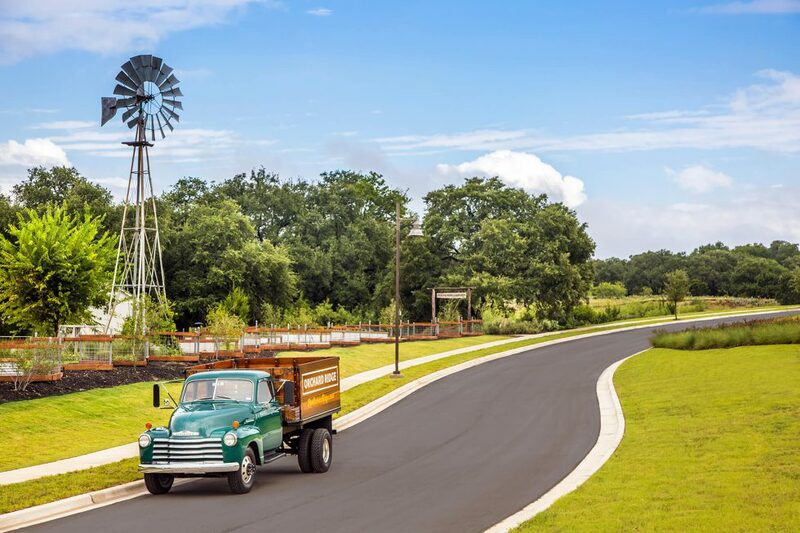 With 248 acres and 670 homesites, the community features an expansive system of walking trails, playgrounds, orchards, community gardens, and neighborhood parks in Texas Hill Country. Orchard Ridge has held its grand opening and model homes are now open. • Arden, Palm Beach County, Florida. 2,000 homesites are set within 1,209 acres that include a 5-acre community farm, mile-long central lake, 20 miles of trails, and 176 acres of parks and open space. Opening soon. • Homestead, Schertz/Cibolo, Texas (near San Antonio). Its 522 acres offer 1,471 homesites with welcoming front porches and sustainable building, connected by five miles of trails to ponds, recreational parks, and natural surroundings. Model homes are now open at Homestead. • Miralon, Palm Springs, California. One of the largest new “agrihoods” in the U.S., Miralon’s 309 acres will include 1,150 Modernist-inspired residences and the transformation of an 18-hole golf course into olive groves and community gardens. Homesites will open for sales in Q3 2018. At the heart of each Freehold community is an amenity center. This includes the clubhouse, or Hub, where residents may grab morning coffee or lunch at the Wi-Fi Café, gather community information, or talk with the on-site management team. All but one of the eight Freehold community has a full-time lifestyle director. Also central to Freehold’s vital communities approach is healthy living. Each of the developments includes a fitness center and community trails. Several of the developments are also innovative “agrihoods,” centered on community gardens. A highlight of Freehold’s Palm Springs development, Miralon, is its transformation of a previously constructed 18-hole golf course into working olive groves, community gardens and walking trails.